ABB, maker of the Terra 51 CHAdeMO fast charging station, announced today that it is also supporting the new Combined Charging System (CCS), and will bring a new lineup of products to market in 2013. ABB will feature both a stand-alone CCS charging station as well as a multistandard station. The latter will let potential plug-in electric car buyers not worry about what protocol (CHAdeMO or CSS) their vehicle is optioned with. Now everyone can be satidfied. According to the company, ABB was the first company to show-off a working prototype of the CCS standard at EV26 in Los Angeles last year. All 3 stations are rated at 50 kW, while a 20 kW variant will be launched in both single CCS and multistandard outlets later this year. 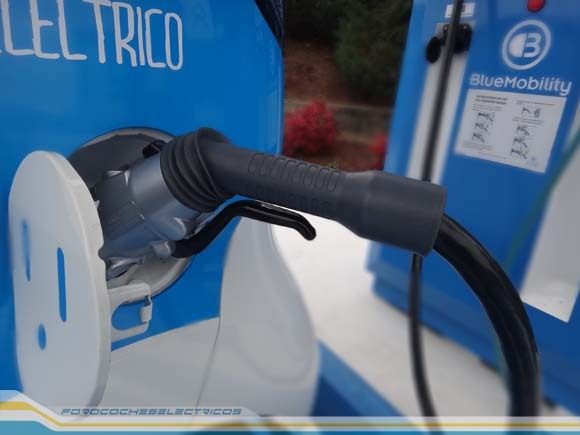 similar to the current CHAdeMO 20kW stations they offer for workplace and retail locations. Cost on these new systems? Still very much unknown. PDF link to new multistandard DC charging station can be found here. 15 Comments on "ABB First To Bring Combined Charging System, And Multistandard To Market"
Great report, Jay, as always. Would you consider starting a thread on MNL? I’m sure quite a few people might want to hear it and have an opinion to share. I’m just glad to see some of these multi-functional chargers starting to come out. We really need to see some ‘common sense’ solutions from the iindependents. Clearly we are not going to see it from the OEMs. Has anyone installed one of these (the chademo ones) in the US, yet ? I’m curious now George. That’s my picture where did you get it from? As you can see it has a CHAdeMO connector. The unit was just installed and they didn’t even have the CCS connector at the time. It has since been swapped out for a CCS connector so they can use it on the cars they are testing there. May be I should restate – has anyone installed a charger that is available to public for charging Leaf/i ? yes, they’re around…depends on where you are. I think he means specifically this ABB charger specifically not any CHAdeMO. At ABBs big annual show in Houston they were showing off this charger and even had a LEAF on the floor. Hi, here is a dual fast charge point, with more than a year on the market. And a picture when I’ve used on february 2012. Has SAE finalized the specs on the plug yet?.. I think they are still working at it.